plug and play, no software installation is needed. The surrounding small black rectangular areas are touchless buttons. When a finger or any reflective objects such as a pencil head is placed 0-5 mm above the sensor, it functions as a button is depressed. When the object is moved away, it functions as the button is released. Touchless buttons avoid the common clicking pains. 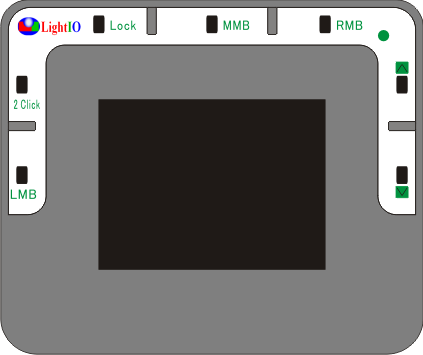 LMB - Left Mouse Button, MMB - Middle Mouse Button, RMB - Right Mouse Button). 2 Click - One triggering performs the double-click function of the left mouse button. Lock: When a button sensor and the lock sensor are triggered at the same time, the button stays down until the lock is triggered alone again. This allows the drag'n-drop operation to be performed without any strain on hand. When the lock is on, the LED is turned on. Triggering the Lock sensor alone again will turn off the lock. If you find the LED is on for no obvious reasons, it may be because the Lock sensor is accidentally turned on. The 2 sensors with arrow head labels are touchless-scrolling sensors. The Pad area is at the center of the image. The pad has 2 modes to move the cursor on the screen: Move mode and Still mode. The Move mode is like the regular touch pad, i.e. the cursor moves as the finger moves. The difference from the regular touch pad is that not just fingers, but any non-transparent stick, such as a pencil or pen, can work just as well. Also no pressure needs to be applied to the touching point, 1mm proximity works just fine. Still mode is to place a finger stick on the pad surface and the cursor moves. The direction of the movement is from the center of the pad to the position of the contact point. The longer the distance from the center to the contact point, the faster the speed. This mode reduces substantially the movement of the finger and arm. Covering the 2 Click sensor and the down-scrolling sensor together turns on the Still mode, up-scrolling sensor for the Move mode. The product ships with Still mode on unless otherwise requested. The LED is turned on upon powered up, it then goes off when the initialization process is finished. During operation, if any sensor is triggered, the LED is turned on. It goes off when no sensor is being triggered. However, when the LOCK is activated, the LED stays on even though no triggering happens. If the LED is on when the module is not in use, first check if the LOCK is activated accidentally, i.e., trigger the Lock sensor again. If the LED still stays on, then it may be caused by strong infrared in the ambient light, or the slits around the pad is blocked by dirt or other objects. Cleaning the pad may solve the problem. Note: To function well, this product needs to avoid direct facing light sources with strong Infrared beams such as candescent lamps, sunshine, or reflective surfaces of sunshine. This device is designed to protect your fingers, wrist, and shoulder from pain and injuries caused by pointing and clicking activities. It's best for people with injuries or arthritis in the hand or arm. It can also help you to reduce the stress from using of computers. The protection of fingers comes from several features that eliminate external forces acting on the fingers. The device can be operated with a pencil, pen, or finger to trigger the infrared sensors in proximity. While no direct contact is needed, touching lightly works too and offers a tactile feedback that some users like. The touchless buttons eliminate the clicking pains all together as clicking doesn't feel anything any more. The Still mode let your finger at rest when moving the cursor, so no impact on fingers either. Even if you do prefer to use your finger on the Move mode, you can operate in proximity of the pad, or use your finger nail tip to touch the pad so that pressure on the finger can be reduced to a minimum. Unlike other pointing devices, there's no gripping or holding forces on fingers either here. The pad is designed to be thin, about 1cm, such that the wrist can remain flat and avoids pressure on the carpal tunnel. If you use a pencil, or tilt the pad, then you can keep your wrist at its natural 45 degree direction and avoid the twisted pressure on the nerves when you palm is facing down. This is a tip from a neural surgeon. The Still mode also reduces the moving and shaking forces on the wrist. The two main causes of shoulder pain from using a mouse are Static Fixed Posture and Frequent movement of the arm and should joint. They are both avoided by our Touchless Mouse Pad. Because the pad doesn't need to take on any force, it doesn't need a firm support and can be placed any where at ease. Some people even use double sided sticky tape to attach the pad to their legs so that the arms can rest at their most natural postures when using the pad. There are also people who put the pad on the ground and use their feet to do the job. Stress can come from too much and too quick activities. This Touchless Pad forces you to work with a reduced activity and relatively slower manner to achieve better results for your body. It's better for every body to use at home and relax the body and mind. Over all, this device is designed from ground up for the benefits to your health. The team of LightIO have incorporated the learning from many years of research and experiment into this product. We wish your health will benefit from it just as we do.